The largest cities of Poland are Warsaw, Lodz, Krakow, Wroclaw, Poznan and Gdansk. The face of the ancient city has been being formed over many centuries and now bears the imprints of many eras and architectural styles from the Middle Ages to the present day. This famous city have preserved many splendid monuments for the people. Warsaw for more than four centuries has been the political capital of Poland. Being spread on both banks of the river Vistula, this, without doubt, main city in the country, is interesting not only for its cultural heritage, but also for constantly changing appearance. The real symbols of the capital are the Royal Castle and the Old Town. The basis of modern Warsaw is the Old City. It was founded in XIII - XIV centuries and it is one of the most beautiful parts of the capital. There are almost all historical and architectural monuments are concentrated here. After World War II the complex was almost completely destroyed, but then it had been carefully restored. The Market is the center of the Old Town. There are several temples and monastery complexes with the preserved works of art and monuments of national culture of XIV - XVIII centuries situated in the Old City. Near the Market there is one of the most famous temples of the city, The Cathedral of St. John. In the capital there are many parks, the most popular of which is Łazienki. In summer, on weekends, near the monument to Chopin there are held concerts of famous pianists, performing music of a genius composer. Those who wish to see the panorama of the city can go up to the thirtieth floor of the Palace of Culture and Science, located in the heart of Warsaw. In Warsaw, there are 43 museums, the largest of which is the National Museum, which has the monuments of Egyptian, Greek, Etruscan and Roman culture and a huge collection of Polish and European paintings. If Warsaw is the political capital of Poland, then Krakow, of course, is the cultural capital. Well-preserved since the mediaeval era the Old Town and unique Vavel were put into the UNESCO World Heritage List. Among the sites to visit are also the Market Square, the Temple of the Virgin Mary, the University Collegium Mayus with its collection of astronomical instruments, and much more. The heart of Krakow is the Old Town, which is located in the Planty Park. Location of the streets and some historic homes of the Old Town have been preserved since 1257. And on the Main Market Square at noon each day, the signal of the tube is suspended as well as when it was interrupted by a Tatar arrow many years ago. In Sukennitsy, old trade rows, you can buy souvenirs. To Relax andrefresh is better in the historical places: to drink coffee or to eat the perfect cake with whipped cream at Mihalikov’s Pit, the favorite site of the local elite. You can also eat at the famous Havolka or Vezhinka, where in the XVII century monarchs had their dinners. No less interesting would be to visit such cities as Wroclaw and Lodz. Wroclaw is famous for its attractions: Hall of the Peoples put up to the UNESCO World Heritage List, Cathedral Island, Grunwald Square, the Church of St. Elizabeth and Wroclaw Palace. 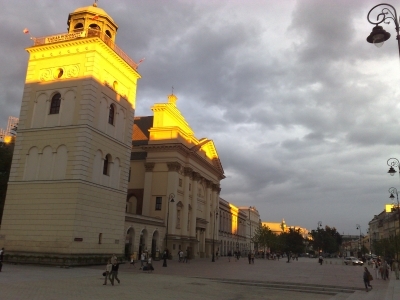 The second largest city in Poland, Lodz is famous for its National Film School. There had been trained Andrzej Munk, Andrzej Wajda, Kazimerzh Karabazh and Janusz Morgenstern, one of the founders of the Polish Film School. Each city is unique and requires individual attention. However, those who visit the city for only a few days can immerse themselves in the unique atmosphere of entertainment and cultural legacy of Poland.